We’d love your help. Let us know what’s wrong with this preview of The Dead Circle by Keith Varney. Something is terribly wrong in Detroit. When Chris and Sarah bought an abandoned library to renovate and live in, they expected to be on the ground floor of the revival of Detroit. But unbeknownst to them, the city is about to fall. The devastation begins with a single woman who mysteriously tears off her clothing and starts walking the perimeter of an empty lot. Within mi Something is terribly wrong in Detroit. When Chris and Sarah bought an abandoned library to renovate and live in, they expected to be on the ground floor of the revival of Detroit. But unbeknownst to them, the city is about to fall. The devastation begins with a single woman who mysteriously tears off her clothing and starts walking the perimeter of an empty lot. Within minutes, hundreds of disparate people inexplicably join her to form a giant human circle slowly revolving like a hurricane of flesh. Moved by inexorable forces, they twitch and spasm, contorting their naked bodies in a primordial death dance. They’re oblivious to everything, even the unfortunate souls who fall beneath their feet. Bewildered citizens and authorities are desperate to know what’s causing the bizarre event… at least until it starts to rain. To ask other readers questions about The Dead Circle, please sign up. I've read many zombie books, but I've never read one quite like this!! It was amazing. It starts with a meteor crashing into a lake. The water from that lake flows into a filtering plant where it ends up in Detroit. All it takes is one single drop, either ingested or on your skin. When one woman tears off her clothes and wakes the streets of Detroit naked, nobody realises it's the start of the end. One by one the people start to become unresponsive, get naked and walk in a circle. Everyone seems I've read many zombie books, but I've never read one quite like this!! It was amazing. It starts with a meteor crashing into a lake. The water from that lake flows into a filtering plant where it ends up in Detroit. All it takes is one single drop, either ingested or on your skin. When one woman tears off her clothes and wakes the streets of Detroit naked, nobody realises it's the start of the end. One by one the people start to become unresponsive, get naked and walk in a circle. Everyone seems to converge on the empty lot and just join in on the walking. Around and around they go, even when someone trips, the crowd keeps going. Days and weeks pass with this happening, the people keep walking, turning themselves into living skeletons. Just what is going on? Meanwhile, Chris and Sarah are a young couple renovating an old library. They don't realise what is happening till they hear the news. They know that one single drop of water can mean their doom!! This is their story of trying to survive the impossible. What can I say to do this story justice. My synopsis of the story doesn't do this justice. It's an incredibly unique and entertaining read and one I devoured. The author grabs you from the very start and takes you on one heck of journey. The idea behind the "zombies" was brilliant. I loved that he took an old idea and made it his own! The whole plot was fast paced and gripping. I loved Sarah and Chris. They are such a cute couple and despite living on top of each other during the apocalypse, they work well together. They can't leave the house whenever there are clouds, just in case it rains. They are running out of supplies and decide that they cant leave it any longer, because winter is coming and with winter, comes snow!! How are they supposed to even leave the house when the snow comes? All goes well on the supply run till, suddenly, the "zombies" suddenly stop walking in a circle and come after Sarah and Chris. The zombies hunger seems to have woken up and now they search for food! Sarah and Chris are determined not to be on the menu, but things don't always work out!! Imagine it. We can survive a long time without food. But going more than a few days without water will kill us. Something is wrong with the water. It’s turning people into mindless walkers. It only takes one drop. Then, they strip off their clothes and head to a central place in Detroit. Once there, they join a crowd of others, walking in a circle, limbs sporadically twitching, eyes rolled over white. No mind left, they walk in a circle, and more Water, water, everywhere, but not a drop to drink. Something is wrong with the water. It’s turning people into mindless walkers. It only takes one drop. Then, they strip off their clothes and head to a central place in Detroit. Once there, they join a crowd of others, walking in a circle, limbs sporadically twitching, eyes rolled over white. No mind left, they walk in a circle, and more join them. Chris and Sarah, a married couple, have just bought their dream house. Well, it will be. They envision turning the abandoned library into a home. A place to raise kids in. A place to grow old in. But, that’s all changed now. Since the rains started. Since the water betrayed them. Now, they struggle to survive. Seemingly the only ones unchanged. Waiting for a clear day to go out and forage for supplies. Winter is coming. No power in the city means no heat. They need to go outside. They need to figure out how they’ll stay warm during the winter. They need to gather food and safe drinking water. Once it snows, they’ll be trapped inside until spring. Then, things change again. The walkers aren’t circling anymore. They’ve broken away, wandering, looking for food. Any food. It’s more dangerous than ever to venture outside, but Chris and Sarah have no choice. Just think of the obstacles they must have face. Water is everywhere. You can’t risk going outside if there is the slightest chance of rain. Even if it hasn’t rained in days, a drop could be lingering and that’s all it takes. You reach to open a car door, be careful. You look away for just a moment and right in front of you is a water puddle. You walk under a tree, water drips off the leaves. This story starts out so innocently. Then something happens that knocks you back on your heels. From then on, you are in Chris and Sarah’s shoes. You struggle with them, you stratagize with them. You run with them. Will you die with them? This is one I’d recommend to those who enjoy an apocalyptic thriller with a new spin on zombies. And to those who like suspense with a touch of horror. Like a pressure cooker, the suspense builds, the danger builds, your connection with the characters builds. And then it ends. My sister would have hated the ending. I didn’t. I wonder what you’ll make of it. 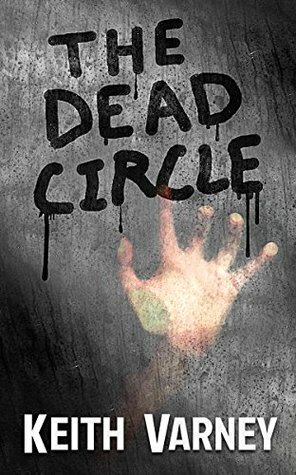 Keith Varney had me hooked from the prologue — I knew immediately that The Dead Circle would be a book that I would have a hard time putting down. The only caution I would throw out there is that I definitely would not suggest this book for the faint of heart or younger readers! The descriptions paint a vivid and rather horrifying image in your mind, sparing absolutely nothing. A few parts of the book were a little more morbid than I expected, but it added to the book overall. I actually had to Keith Varney had me hooked from the prologue — I knew immediately that The Dead Circle would be a book that I would have a hard time putting down. The only caution I would throw out there is that I definitely would not suggest this book for the faint of heart or younger readers! The descriptions paint a vivid and rather horrifying image in your mind, sparing absolutely nothing. A few parts of the book were a little more morbid than I expected, but it added to the book overall. I actually had to set the book down a few times because it freaked me out that much. I literally began feeling sick to my stomach. Not to mention, the setting of post-apocalyptic Detroit city was very well thought out and bone-chilling. Throughout the book you are given very personal and realistic backstories on some of the small supporting characters, as well as the main characters, connecting you to them. You cannot help but have a glimmer of hope for these characters and their survival. However, I learned quickly not to get too attached. What a ride I had while reading Keith Varney's debut novel, "The Dead Circle". I am a native Detroiter and could relate as the author cited streets, buildings, the blight, mass exodus from the city, the vast emptiness of past neighborhoods as it all reverts back to nature, and other topics related to the city.. The story hooked me immediately within the first chapter; something weird was happening, first, people began parading along streets, oblivious to their surroundings, but seemingly on a mi What a ride I had while reading Keith Varney's debut novel, "The Dead Circle". I am a native Detroiter and could relate as the author cited streets, buildings, the blight, mass exodus from the city, the vast emptiness of past neighborhoods as it all reverts back to nature, and other topics related to the city.. The story hooked me immediately within the first chapter; something weird was happening, first, people began parading along streets, oblivious to their surroundings, but seemingly on a mission, and second, everyone of them head to an empty lot downtown and join others as they march around the property in a ring of humanity. Chris and Sarah are a married couple and have lived in the city for the last ten years. They are aware of the meandering bodies and intercept a report that water was the culprit - no drinking, bathing, stepping in puddles, or walking in the rain. Doing so will turn a person into yet another addition to the growing circle of dead. None of the "marchers" are violent so husband and wife are able to move around freely while stockpiling supplies and improving the defenses on their home of the last decade - a 50-year-old library that was never finished or occupied before them. The author uses back stories to develop his characters - even some who become "Marchers". He also paints visceral images when describing the ring of marchers and the thousands who have fallen and were smashed into goo. All is well for four months and the couple is making progress in building their stash and improving their fortress. Only winter is days away and snow is evident - poison to anyone not infected yet. However, the ring of marchers suddenly stop and move off into varied directions looking to feed. Most of these "marchers" are only shells of their former selves, dehydrated and like paper mache. Only thing is, they are now hungry and anything living is food on the table. They can't see but are guided by the slightest sound. Chris and Sarah soon find themselves on the defensive and try to wait them out. Unfortunately, a small fire sets off the library fire alarm and the sprinklers will soon come on to drench everything within with water. What are they to do? Tens of thousands of "marchers" are now attracted by the alarm and begin to consolidate on the library. It's a race with three possible outcomes: survival, become food, or get wet and turn into one of those things. Keith Varney is fantastic at garnering suspense and holding readers at the edge of their seats. Highly recommended! Great work Mr. Varney! Keith Varney had me hooked from the prologue — I knew immediately that The Dead Circle would be a book that I would have a hard time putting down. The only caution I would throw out there is that I definitely would not suggest this book for the faint of heart or younger readers! The descriptions paint a vivid and rather horrifying image in your mind, sparing absolutely nothing. A few parts of the book were a little more morbid than I expected, but it added to the book overall. I actually had to Keith Varney had me hooked from the prologue — I knew immediately that The Dead Circle would be a book that I would have a hard time putting down. The only caution I would throw out there is that I definitely would not suggest this book for the faint of heart or younger readers! The descriptions paint a vivid and rather horrifying image in your mind, sparing absolutely nothing. A few parts of the book were a little more morbid than I expected, but it added to the book overall. I actually had to set the book down a few times because it freaked me out that much. Not to mention, the setting of post-apocalyptic Detroit city was very well thought out and bone-chilling. Very well written, and very well told! I really felt like I was in the story with Chris and Sarah - I found myself rooting for them; mad at them when they made some stupid decisions; and really loving that through all the hard stuff, you could tell how much they truly loved each other! I love a good love story, and setting it right in the middle of a zombie apocolypse takes some major talent! Keith Varney's "The Dead Circle" is that rare roller coaster thrill ride of a novel that truly delivers. An explosive setup, a rip-roaring story, and characters so real they practically pop off the page. Chris and Sarah, not to mention their ultra-cool library-becomes-a-house, are Varney's protagonists, and the pair do their utmost to survive in a world gone crazy with zombies. Or, to be more accurate, the city of Detroit gone crazy with white-eyed folks that SEEM like zombies. And the zombies t Keith Varney's "The Dead Circle" is that rare roller coaster thrill ride of a novel that truly delivers. An explosive setup, a rip-roaring story, and characters so real they practically pop off the page. Chris and Sarah, not to mention their ultra-cool library-becomes-a-house, are Varney's protagonists, and the pair do their utmost to survive in a world gone crazy with zombies. Or, to be more accurate, the city of Detroit gone crazy with white-eyed folks that SEEM like zombies. And the zombies themselves aren't exactly soulless, Tom, Assistant Manager and city bus driver Sammy being my personal faves of those gone wacky. The entire novel is laced with a deliciously wry humor, not to mention adventures with tricycles, bowling, intellectual exercises in how NOT to touch the contaminated water, and a perfect balance between horror, playfulness, and absurdity.